Rosemary focaccia bread is filled with a savory, homemade olive spread, Wisconsin mozzarella and feta cheeses, all topped with fresh grilled vegetables. Your taste buds are sure to surrender to The Olive Branch. Combine marinade ingredients in screw-top jar. Cover and shake well. Evenly spread zucchini, pepper and onion in shallow dish; pour marinade over, covering vegetables. Let sit minimum of 4 hours. In bowl of food processor, combine olive spread ingredients; pulse until almost smooth. Heat grill to 400°F. Remove vegetables from marinade and grill 15 minutes, turning often, and basting with marinade until tender and slightly charred. Reduce heat to 300°F. Place vegetables on cool side of grill or side table. Brush 1 side of each bread slice with extra virgin olive oil. Place bread slices, oil-side-down, on work surface. Top 2 slices with 6 mozzarella slices each. Place 3 feta slices on each of other 2 pieces of bread. Place on grill, oil-side-down, cover and grill until cheese is melted. Watch carefully to avoid burning bottoms of bread. 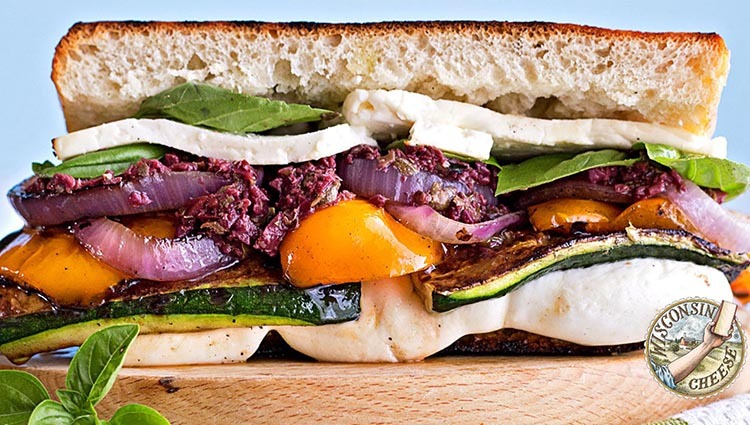 To assemble, layer half the vegetables on bread slice with feta. Top with fresh basil and half the olive spread. Top it with bread slice with mozzarella, cheese-side-down. Repeat with second sandwich.